And duty called, even on a Sunday. For school, a display on the Victorians, ready for a public event on Monday evening, was necessary. And I needed Victorian artefacts. I trawled the sources of Victorian wooden toys in my mind and decided wistfully that a trip into our local market town was going to be a must. I must make a wet, crowded, expensive drive, alone because everyone else in the house had colds. I braced myself. I got in the car. And I turned the ignition key, backed out of the drive and got on the road. I found a parking place in a great shopping cathedral and scuttled off through the fat drops of rain to the museum, a worthy red-brick building. I walked through the doors into a museum which, with the gloom outside, looked as if the caretaker had already turned half the lights out. My heart sank. Even one of my favourite sanctuaries felt abandoned. I located and bought what I had to. And then, I instinctively headed for the one exhibit with which I must commune, this rainy afternoon. It is two floors up, in a glass lift. I stepped out expecting to see no-one. There were a few straggling sightseers, grandparents with toddlers looking for rainy-day activity. I wandered into the Roman galleries: and there he stood. My battered Roman eagle. He is called the Silchester Eagle, and the Romans are thought to have thrown my eagle away for scrap. Silchester is the site of an old Roman town, Calleva Atrebatum. We’ve been digging it for well over a century: Reading’s University oversees it these days. My eagle was discovered a very long time ago, on October 9, 1866, by a clergyman. The Reverend JG Joyce, who excavated the dig from 1864-1878, was certain it was a very important eagle indeed: probably part of a Roman standard. And it was in this capacity that author Rosemary Sutcliffe used him to inspire her classic tale The Eagle Of The Ninth , published in 1954, a must-read for anyone who hasn’t. In actual fact, research has revealed that he was once sitting on a sphere as part of a Roman ornament. Than the original craftsman was extremely skilled but subsequent repairs after accidents were clumsier. And that, according to his location, he was probably awaiting being melted down for scrap. Originally, my eagle had glorious great outspread wings, but no more. He is time-battered. But he has a circumspect air, as if really, it is all one could expect from life. He has seen a rainy afternoon or two. Here we stood, he and I, in a darkened room on a wet September afternoon. His attitude seemed to speak much louder than words. This is life, he said. You keep going, you tread each step, you serve your masters faithfully, spend years buried under ashes and lose a wing or two: and still, a kind of immortality can be yours. With a wisdom borne of more than a millennium of experience, I would swear he was smiling. And then it was time to leave: to draw away from my eagle and trail reluctantly back to the gliding glass lift, leaving him amongst the coins and pots and tiles and remains of a city which died more than a thousand years ago. Time to come down from the mountain and rejoin life in the soggy streets of an English market town. Posted in Quirks of History, UncategorizedTagged archaeology, Eagle of the Ninth, history, Romans, Rosemary Sutcliffe, Silchester, University of ReadingBookmark the permalink. And didn’t it rain….. If I’d had the chance I’d have stayed under the covers. Hope you haven’t been flooded out, Kate, the situation isn’t good in some places. Stay safe. I hope you got what you wanted for your display. How’s the new job going? So-so….but I got roughly what I wanted and saw my eagle into the bargain 🙂 Glad you had a good day to take Techie down to Bath. Your eagle is indeed wise, sad, immortal. I found your conversation with him very moving. And I’m going to check if the British Council Library has ‘The Eagle of the Ninth’ because I have not read it. 😀 Glad you tracked it down. There are PDFs available online, I think! Yeeees. Sorry to drag you away from those beautiful French landscapes. Weather ok there? He is, Sidey. I think he might be a union eagle. Solidarity, brothers, as they say. I see him as an adventurer, leading the way, breaking new ground. I once went out with a girl who looked like that! Is that a good thing, Jim? The Eagle does indeed look a bit battered and worn, but, his lot as the object of admiration certainly offsets his physical status. Interesting how we are drawn to certain objects of antiquity, they don’t have to beautiful, just meaningful to us. As usual, you get to the crux of the matter, Lou. If it speaks to us it has a magnetism which the flashy new acquisition cannot match. Hi Rita! I heard there was a film made. I’ll take a look, thanks! These Roman types, they’re hardened by years of war on a distant soggy front, Fiona. They can grin through the mud. Think of all the things he’s seen, all the stories he could tell if he weren’t so world-weary. I just saw you were FP’d, Kate—-congratulations!! Your blog is one of my favorites, and you make historical vignettes look so easy to write (even though I know they aren’t). This is life, he said. You keep going, you tread each step . . .
Have a lovely time communing with Nemesis, Debra. I must have a look at her! He does have a bit of the parrot about him, IE. I miss Rosemary Sutcliffe. I have a yen to read her again. Dear Kate, recently, I began a second blog–on writing. But always, when I come to your blog and read your postings, I know that whatever you wrote on writing, I’d read immediately for you are a master. Your word choice–note “companionably” toward the end of the post–astounds me for with a single word you immediately paint in my mind a person, a feeling, a time. I am in awe. Peace. Ah, Kate, you’ve done it again; dredged up a sweet memory for me. This is where I used to go to commune with the eagles: http://openplac.es/trips/skagit-river-bald-eagles-in-rockport-wa Thanks! Karen, this must have been quite an experience: I have never watched an eagle except in one of our sanctuaries. I’d love to see one in the wild. Connecting with something such as this is like going back in time, imagining what this eagle saw and heard and smelled. I wonder who made him, whether his wings were clipped because he tried to fly away. He is a story waiting to happen, isn’t he, Andra? Stopped Roman, and settled in England? Prodeant vexilla. I wonder what he makes of the average modern gawker? Mind you, they are a better breed than those who gawk not at all. True: though on a rainy Sunday people trawl desperately round for something undercover to take the toddlers to and it can be grim. 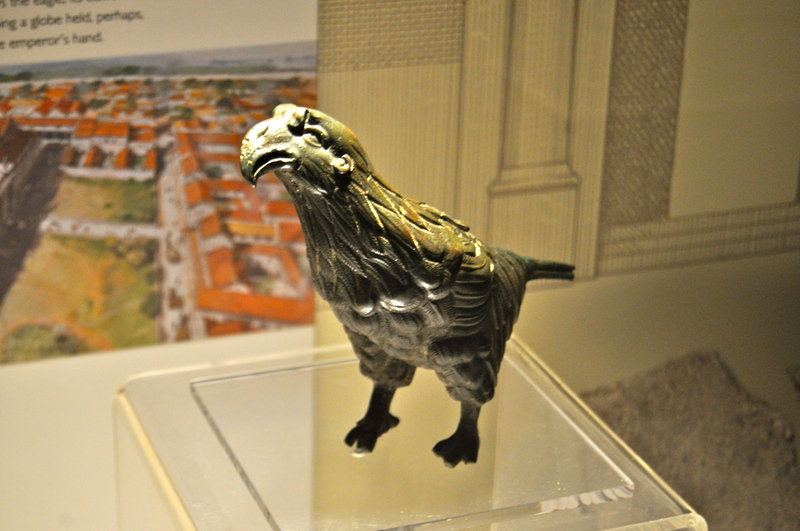 No one had found the eagle, though…it was all quiet in the Roman gallery. It’s curious what we’re drawn to and what gives us a sense of peace. If he could talk, the stories he could tell. I’m glad you told yours, Kate. Thanks, Judy. He cheered up a rainy afternoon no end. Hey just seen it where you were Freshly Pressed. Congratulations! I feel like I just read literature. My head hurts from British Lit flashbacks :). Thanks for the post, I really did enjoy it! I should go and find somewhere darkened to lie down. Those flashbacks can be dodgy. I do fluffy kitten posts too…. We all love fluffy kitten posts! And babies! Lol great blog, I enjoy it! Great post! I love your eagle! Congratulations on being freshly pressed! My library has a copy of the book and I am going to put it on hold to pick up later this week. I can’t drive today as I has my wisdom teeth out this morning :-). I just returned from a two week trip to Israel, so archaeology and history are on my mind. I envy you. I have always wanted to go out there and see a totally different kind of archaeology from our own here in the UK. What an excellent idea, Gabrielle…. First time readers: She’s already taken, this writer of great renown. She’s ours! We will not allow the smash of humanity to rob her from us only to be put on display in some obscure fashion. Even if it is beside her beloved eagle! I love the way you ended this… you’ve brought a story—a moving story—out of a bird without a voice. 🙂 Very lovely! I haven’t thought about the Eagle of the Ninth for a while; but that book sure inspired me when I was small. So, it’s great that a) a post about an Eagle was freshly pressed, and b) that I was lucky enough to see it. Thanks, PJD- or is it CIA? Sometimes these eagles – especially the battered Roman ones – have a way of attracting your attention. KATE!!! Congratulations on Freshly Pressed!!! Hi Rita 🙂 Thanks so much, and for reblogging too! Congratulations to ritaLOVEStoWRITE faithful follower, and fabulous writer, Kate Shrewsbury for having her blog post “My Battered Roman Eagle” selected as Freshly Pressed on WordPress. Go see it now! And way to go Kate!!! The life the soul of a thing with a story shares…. I know – I’m pleased really that the eagle got a wider audience through Freshly Pressed. I feel he deserves attention. He does. I’m glad to be part of his ancient story; it is my story now. Kate, I love your post. The Silchester Eagle is a noble, patient-looking old fellow, isn’t he? A touch of sadness in the eyes, as if he’s wondering what indignities the future may yet hold (an interactive exhibit with push-buttons, perhaps? ); but you can see he’s in for the long haul. Nothing surprises him any more! I’m glad somebody managed to make a positive, atmospheric post out of the revoltingly rainy days we’ve just gone through – well done! Sue, thank you for coming along to read and comment. Poor eagle: I don’t think push-buttons are his thing at all . But, as you say, he has made it through 2,000 years. How many more, I wonder, and where will he go next? Hiya! I see you’ve been Freshly Pressed too, congrats!! You really do deserve it, the amount of work and knowledge that goes into eah day’s post is remarkable. I love the way each post starts off with something simple, or about your own life, and then heads off into something really informative. Fascinating read. I love what you wrote about this remarkable artifact. I see life as all about moments in time-good, bad, and everywhere in-between. It intrigues me to think about the moment when this eagle was created and masterfully stood watch over some part of the Roman empire. Thanks for sharing your experience. Congrats on being FP! Cheers! I love that image, of when the eagle was new, and great astride his sphere. Thank for coming along, William, and taking the time to comment. Alison, thank you – of course: the eagle is a metaphor for the writer or artist who goes on creating when there seems, simply, no audience and no point. We’re all in it for the long game. Oh I love this! Rosemary Sutcliff was my favourite writer when I was growing up, and I recently re-read Eagle Of The Ninth. I was delighted to discover that it’s still as great as I remember it being. I knew that it was based on the Silchester Eagle, but I’ve never actually seen him before. Thank you thank you thank you for posting this! It’s remarkable how objects can evoke so much history, so much of the human experience. It is: we have always made beautiful things in the hope that it might render them, or even us, immortal. I would love to hear them…. Your eagle is very much like the one that adorns the tip of my flag pole. He watches over me patiently 24/7 everyday of the year. What would the world be without soaring eagles to inspire us? They are such a powerful icon, aren’t they, Grumpa Joe? Hey Kate, sorry I’m reading this one so late, but I somehow missed it — and this is the one you get FPed — go figure and congratulations! What a moving post about that little battered but stoic bird. What a pity that his wings have entered the ether, but it’s comforting to see that he’s still standing so you could share your encounter with him and his history with us. Thanks, Lame, I’m late answering, apologies! I’m always amazed at how the eagle has managed to weather two thousand years. Even without his wings he is majestic! Hello, Kathleen: yes, he has a certain dignity in his stance, doesn’t he? I love your conversation with him. Inanimate objects can be quite inspiring sometimes. They can. Sort of self-reflection. …and so many museums to choose from, Charlie! I enjoy Jack Whyte’s historical fiction post Roman Britain books. .